Shine 2012 Festival Opening + Dell-Intel Youth Concert featuring JAYESSLEE !!! 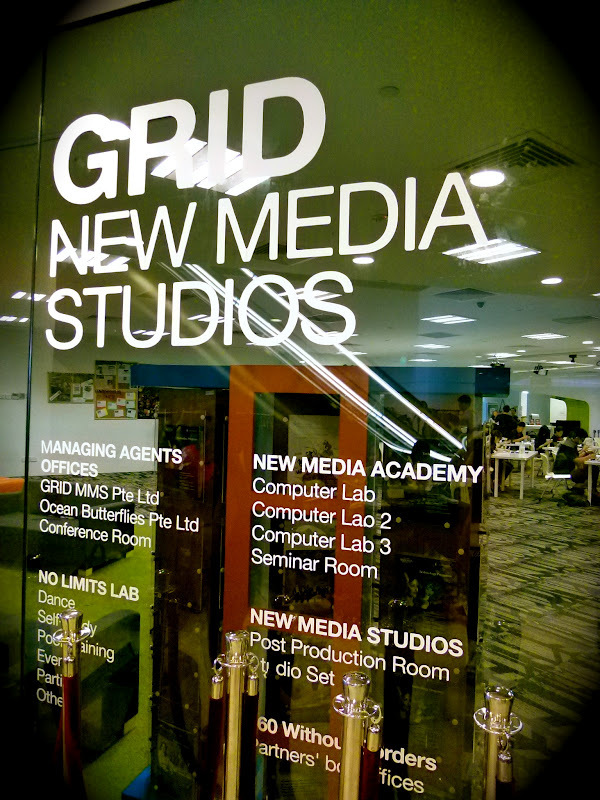 I’m at Grid New Media Studios for a Videography workshop organised by Panasonic. As ya’ll know, I’ve been making YouTube videos for almost a year right now but I haven’t been really trained in shooting or editing videos. So I guess it was really timely when there’s a videography workshop organised by Panasonic and I immediately signed up for it! The highlight of the whole event is getting to attend the Dell-Intel Youth Concert where we get to catch Jayesslee’s Live performance on stage! The best part is that we were seated right infront of the stage!!! Right at the steps leading up the stage! Check out the videos which I’ve filmed right at the end of this post! We had a short seminar on how to shoot our videos using Panasonic HC-X900M camcorder and later, we were told to head down to the Mascot Parade for Shine 2012 Festival Opening to practice our videography skills! I was one of the 5 lucky bloggers who get to borrow this Panasonic camcorder set for a month to cover the Shine events held in the youth month of July! Here’s one truth which I would love to share with you about myself – I have not used a video camcorder before! All my videos were recorded using my Panasonic Lumix compact digital camera or my macbook. I make videos for fun only and I couldn’t afford to invest a couple thousand of dollars to purchase a video camcorder. But anyway, learning how to use one is good enough for me. One cool function about this camcorder is the fact that you are able to make 3D movies! 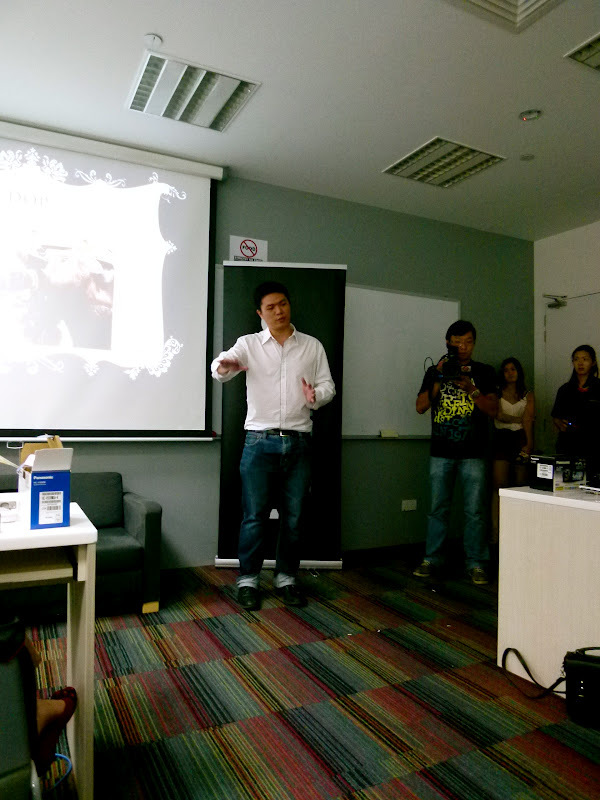 Cheng Ding An is a local director who produced Kallang Roar and Ghost on Air. He is one passionate Indie film director who went through alot of challenges in the movie-making industry before getting to where he is right now. During the workshop itself, he shared with us his experiences of being a film-maker and a risk-taker who took all odds to chase after his dreams of becoming a successful film director. Here’s a classic quote from Cheng Ding An which strike a chord in me. ” Don’t blame it on the world.Just go and make things happen.”-Cheng Ding An. Good advice, indeed. It just as timely for me who sometimes put the blame on the things that surround me. Don’t waste time trying to curb your churning anger, just step out of your comfort zone and try to make it out on your own. Due to the lack of time, we weren’t really taught on how to utilize the Panasonic HC-X900M camcorder to shoot videos but since I’ve been constantly toying with new camera devices ( Panasonic one’s in particular) as a blogger, the function buttons on the camcorder is not unfamilar to me. Within minutes, I was able to find out all the basic functions and settings of this camcorder. I’m pretty amazed at my ablity to do so because all along I thought I was an IT Dummy! After the short seminar, we quickly rushed down to Ngee Ann Civic Plaza for the mascot parade which is part of the Shine 2012 Festival opening. Heard of SHINE festival? Prior to this, I had no idea what it is about except for the fact that this festival is for the kids and youths aged between 13-19 which I’m totally meant not to be part of this. But then, aren’t we still youths? At least we are still below the age of 25! Enjoy being youthful while you can! Organised by the youth for the local community, the annual SHINE festival encourages youth to enjoy a month-long extravaganza of activities,while giving back to the society. To simply put, it is a youth event organised by youths for the youths. That particular Saturday, on the 30th June, was the SHINE 2012 opening festival which features youth-led social movements such as Cosmo Youth Parade which transformed Orchard Road into a fantastical wonderland with thousands of youths dressing up as their favourite manga or comic cartoon characters. Awww…that’s one cute tiger. Why would anyone want to hunt a Tiger down for its skin? He must be a big bad guy. It’s the year of the dragon!The year I was born in! Did you see all the frenzy in Orchard Road that day? Heyo! You’re standing on the wrong territory! So cute! But I wonder why Sakae Sushi chose a green frog for its mascot. I just love that intricate Venetian mask! Tracy and I are busy filming and shooting the cosmo parade. We are “bringing” photos and videos of the Cosmo Parade LIVE especially for those of you who just missed this great spectular show. Mountain Dew – It does quench your thirst on such a terribly hot day. Two singing voices that hit off well. If you’d asked me what is the highlight of the whole event, I would say it’s the live performance by Jayesslee. It’s not to say that they sounded different or better when they sang live on stage but it’s all about witnessing how their music can touch the hearts of the people and how their sweet angelic voices could charm the guys who were constantly cheering loudly to get their attention.It’s all about the music,really. Miss the chance to watch their performance live?No worries, I got it filmed on camera. Watch it here! They are like stars that shine. Being able to sit right infront of the stage was an awesome experience. As I was part of the media, I had the opportunity to stand with the other videographers and photographers for this event. Shoot and filming this event is also part of my task as a blogger but I wasn’t about to concentrate once they started singing. I just wanted to sit down and enjoy their performance. The “Did you know?” fact – Sonia is married! The Shine 2012 Opening festival has come to an end but there are still a string of various activities going on for this month of July!